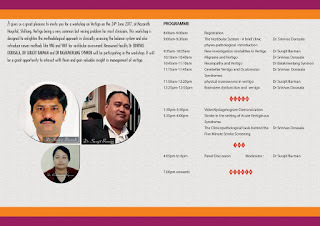 Otolaryngology Update: “WORKSHOP ON VERTIGO AND VIDEONYSTAGMOGRAM” being organised by the Department of Otorhinolaryngology, Nazareth Hospital, Shillong on 24th June 2017. 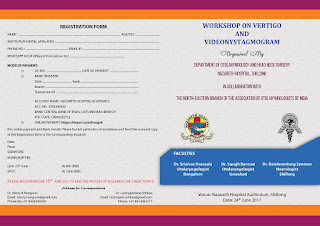 “WORKSHOP ON VERTIGO AND VIDEONYSTAGMOGRAM” being organised by the Department of Otorhinolaryngology, Nazareth Hospital, Shillong on 24th June 2017. We request the pleasure of your participation in the “WORKSHOP ON VERTIGO AND VIDEONYSTAGMOGRAM” being organised by the Department of Otorhinolaryngology, Nazareth Hospital, Shillong on 24th June 2017. Venue: Auditorium, Nazareth hospital, Shillong. Organised by: Department of ENT & HNS, Nazareth Hospital, Shillong.